'What a Vegan Eats' is originally 'Hearty Vegan Food Finds in Singapore' - a series I decided to start writing on for my blog where I review vegan/vegetarian restaurants in this humble red dot. I have not been updating for a while because of my full time job, but I have decided to put aside excuses and start prioritizing things. So, be sure to stay tune for more 'What a Vegan Eats' and videos/vlogs on my Youtube channel! Ling Zhi Vegetarian does not seem foreign among the locals. My parents mentioned they've brought me here while I was younger. For a few weeks before my birthday, my parents were bugging me to search for a vegan buffet where the entire family can dine at to celebrate the joyous occasion. I'm really touched that they're so supportive of my lifestyle! Ling Zhi Vegetarian is owned by renowned Chinese restaurant, Tunglok - which explains the Chinese gourmet cuisine. They do not believe in preparing dishes with gluten, mock meats, artificial coloring and additives. Vegetables were also organic, with a large selection to choose from. My family and I headed there on a Saturday afternoon and paid $24.80++/pax. On weekdays there serve lunch and dinner. While on weekends, they do lunch, Hi-tea and dinner - both ala carte and buffet option available. Unfortunately, we were there rather late (130pm) and Hi-tea starts at 3pm. Customers who come in for the lunch buffet had to finish eating by 245pm. Thankfully, there were still tons of vegetables left, but very small selection of Dim Sum. 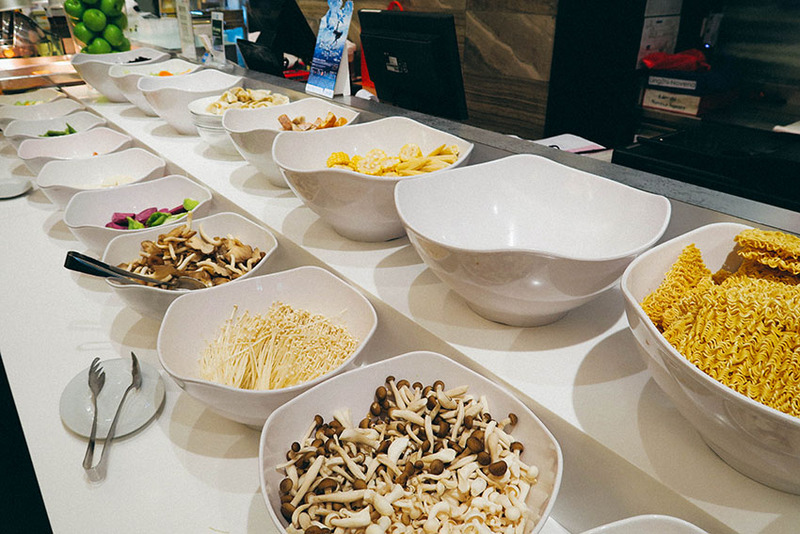 We got to choose 2 soup bases for the hotpot buffet and went ahead for mushroom and tom yum, but had to pay an additional $2/head the for mushroom soup. Now you may think why did we bother paying extra money for the mushroom soup when we had an array of mushrooms to choose from. Beats me too, we only figured out that we made a silly decision after the first round. The vegetables were fresh and I lost count of the number of times my sister and I went to take more of them to fill up the hotpot. Go there early so you have ample time to complete your meal. We rushed our entire meal because we only had less than one hour to eat since we arrive really really late. There was also curry puff, yam pastry and carrot cake for those who fancy the fried goodies. The char siew sou (pork pastry) however, is not vegan. Before I reserved a table, I called the restaurant to check which pastry/dim sum is not vegan friendly :) So always check before you eat to make sure you don't do slip ups unintentionally. It's always better to be safe than sorry. Not forgetting the vegetable curry I took as well! Fragant and tasted like home-cooked curry. My dad couldn't resist and had 2 bowls! It would also be great if they could label which pastries are vegan to make it easier for many. The staffs are mainly Chinese speaking, so they may not be able to understand the terms of 'Vegan' if you can't converse well in Mandrain. Nonetheless, no harm giving them a try. If you have been to Ling Zhi, I would love to hear your opinions on them.